The black house spider (Badumna insignis) is a common species of cribellate Australian spider, found throughout much of Australia and New Zealand. A closely related species, variously called the brown house spideror the grey house spider (Badumna longinquus), has a similar distribution. It is also known as the common black spider. B. insignis is a dark, robust spider, the female growing up to 18mm, with a 30mm legspan. As with most spiders, the males are smaller (10mm), and have longer legs in relation to their body size. In both sexes the carapace and legs are dark brown to black, and the abdomen is charcoal grey with a dorsal pattern of light markings (sometimes indistinct) and a dense covering of fine, velvety hair. B. longinquus is slightly smaller (14mm) with a greyish carapace and red-brown legs. 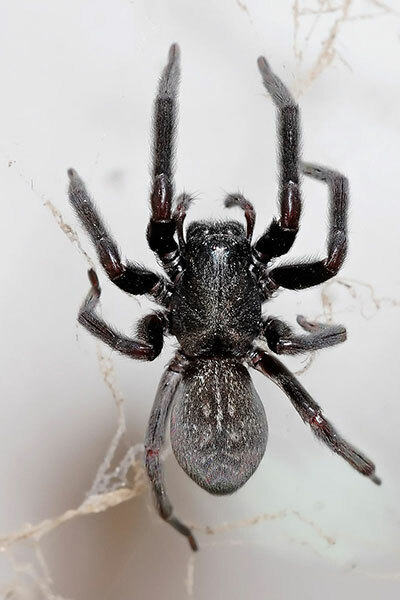 Black and grey house spiders are widely distributed throughout Australia and New Zealand. In natural habitat, they are usually found on rough-barked trees, whereas inside buildings they are often found in corners, around windows and doorways, or where other light sources may attract prey insects. B. longinquus may be found in similar locations, but is more often found outdoors. The webs of both B. insignis and B. longinquus are a messy-looking construct of irregular sail-like shapes. There is a funnel-shaped, silken retreat, usually in the middle or corner of the web, where the spider spends most of its time waiting for prey. The female spider never leaves the web unless forced to. They seem quite attached to their location, rarely changing the position of their webs and because of this, old webs can be quite messy, often with small objects or dust stuck in them. At night the spider comes out to repair and add to the web, often just adding new silk over the old. Males, when ready to mate, go in search of females. The male plucks the web of the female to attract her attention. Once the male has made sure that the female will be receptive, he will approach and inseminate her with his palps. They may then stay together for several days, and may mate again several times. The female constructs several white silk egg sacs, which are secured within the web retreat. The female stays with the eggs until they hatch. The spiderlings then disperse. Occasionally the young spiders stay in the web of the mother for some time, catching the smaller prey that the larger spider would ignore. Predators include the White-tailed spider, as well as parasitic wasps and flies.